I had a friend recommend this pizza place to me a few months back, but it seemed like we just were never in the mood for pizza when we got together or in the area to swing by. So last week I had a craving for pizza and since their location is close to my office I headed over there for my lunch break. 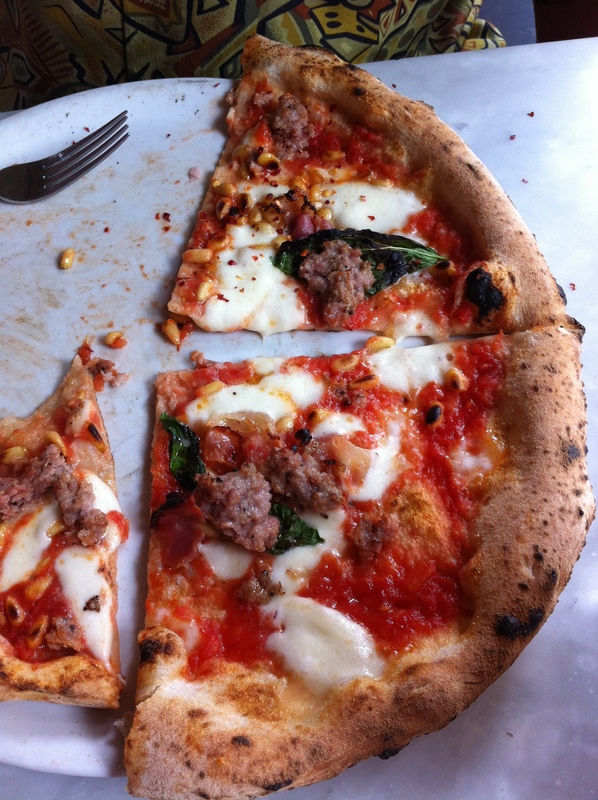 They state that their pizzas are the traditional Napoli style pizzas, using only specific ingredients based off of tradition and baked in a brick oven only fueled by wood. If you would like to read the full history about the ingredients & technique click here to go to their website, sorry there was no direct link to their about us page. Settebello is located in The District in the southwest part of the valley, you can’t see it from the street because it is located on the inside of the shopping center, so it could easily be missed if you didn’t already know where you are going. Upon entering we were quickly seated and for a Thursday afternoon it wasn’t too busy. Despite the fact that they were not busy it did take awhile for someone to come over and take our drink order. But once our waitress did show up she was very friendly and quickly went over how their pizzas differ from what we are use to since it was our first visit here. The pizzas are only cooked for a few minutes in the hot brick oven and they tend to be a lot softer and cannot hold up to a lot of toppings so she advised us against altering their pizzas by too much. Each pizza is approximately 12 inches around and could easily serve two if you have a small appetite or got one of their antipastos to share before hand. The waitress also informed us that they do not slice your pizza unless you ask them to, since this is the traditional way to be served. I can honestly say that I have never encountered pizza not being sliced before being served but I also haven’t been to Napoli. I apologize up front for the half eaten pictures even though I had been taking notes before we got the food once it showed up we just dived right in before I realized I didn’t snap a picture, guess that is one downside to good company you get engulfed in the conversation and forget that you are doing a food review blog. Oh well I did manage to remember before more than half was enjoyed. I ordered the emelia pizza it was a white pizza so it does not come with their crushed tomato sauce, instead it is going to have a cream sauce. 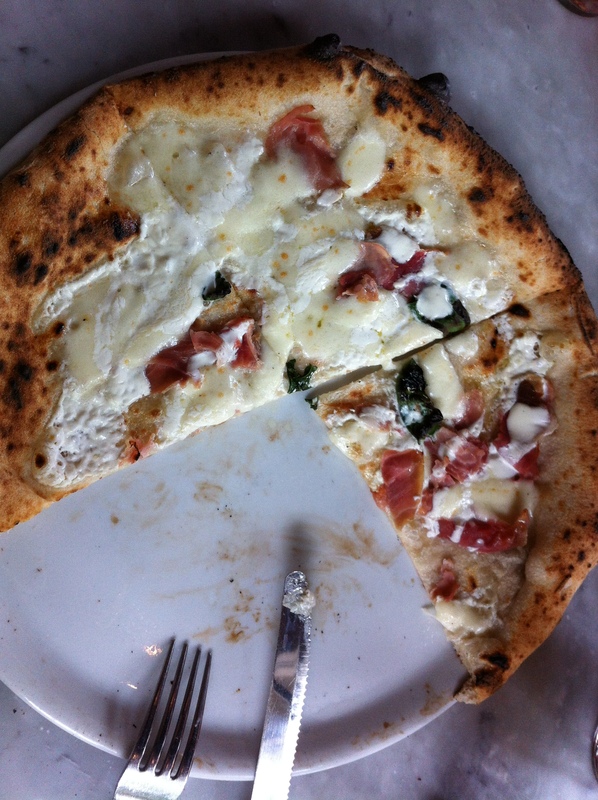 This pizza has prosciutto cotto, panna (Italian cream), mozzarella, parmigiano reggiano, basil & extra virgin olive oil. The crust has a nice chewy bite with a nice charcoal flavor from the wood burning oven. Because it is cooked at high temperature it allows the exterior of the crust to get a nice crunch while staying soft and chewy on the inside. The center of the pizza was a lot less sturdy than what most people are use to, so I can see why they would shy you away from putting too many toppings on your pizza. I decided to go with a pizza without red sauce so I was trying something out of my normal pizza box. I was very glad that I did, the panna had this wonderful sour note that blended perfectly with the sweetness of the prosciutto and the smoothness of the mozzarella. I did ask for a side of their balsamic vinaigrette that came with the insalata to dip my pizza in, this added another lovely level of flavor. Even though I only dipped the whole pizza in the vinaigrette a couple times it was a perfect addition to dip the crust in, almost like having bread before the meal. If you come here and you want something a little different I would recommend this one. My parents ordered the settebello pizza it has crushed tomatoes, pancetta, roasted fennel sausage, pine nuts, mozzarella, basil & extra virgin olive oil. This pizza normally comes with mushrooms but they ordered it without them. This was also another lovely pizza, the red sauce had a nice tangy bite of a good red sauce and the crust was exactly the same as the white pizza above. My step-dad quickly devoured this pizza and said that it was good, even though he would’ve liked a little more meat. I preferred the flavors of my white pizza, but for a more traditional pizza I would go for this one. My mother ordered the insalata (not pictured) to have in addition to splitting the pizza with my step-dad, she was very unimpressed with it. It was field greens with 3 large shavings of parmigiano reggiano, pepper & the balsamic vinaigrette. She said that for $5 there should’ve been at least some tomatoes, she would advise against spending the money on this particular menu item. The vinaigrette was the only good part and it is what made me ask for it on the side for my pizza crust. For our lunch our bill came to right under $50 including tip; we got 2 pizzas, 1 salad & 3 sodas which comes to around $16 a person, this may not fit in to a lot of people’s lunch budgets but I would say that I don’t feel like I wasted my money. I was satisfied when I left, and for most of us this is big thing you want to feel like you got your monies worth when eating out. Overall I wasn’t overly impressed with Settebello, the service was a bit spotty it seemed to me there was a lot of running around but not a lot of people helping those that are seated. But when you did get their attention and let them know you needed something they were quick to get it out to you, so to me that part was very good. Also while there are plenty of food options it was just ok. Even though I enjoyed the flavors of my pizza and the crust, I don’t think I am going to be sitting at home and have a sudden craving for their pizza specifically. That being said if I was nearby shopping and was craving pizza I wouldn’t hesitate to stop here.